Do you know someone who wants to replicate the tastes of their childhood (or adulthood!) without the cruelty? Maybe they want to try veganism but don’t know where to start. We love fresh fruits, vegetables, grains, and legumes as much as the next person but someone new (and old!) to veganism may enjoy plant-based versions of hot dogs, sausages, dairy milk, and ice cream. Animal Place’s Humane Eating Wallet Guide is a handy, informative tool for the new vegan (or vegan-to-be). Inside, find many of the commercially available brands offering vegan versions of “meat”, fish, eggs, and dairy. 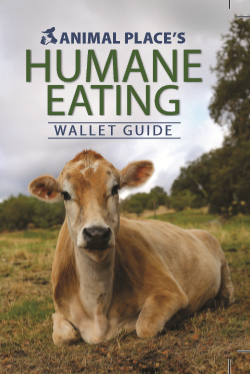 We are generously offering this Humane Eating Wallet Guide for FREE…as long as you cover the cost of shipping! If you leaflet or table or just want to leave some of these wallet-sized pamphlets at work, school, or around the house…then fill out the form below and we will guide you through the order process. Again, the leaflets are free – we just ask you to cover the cost of shipping.